After nursing her hunky firefighter ex-husband Jay Rush back to health, Kate Holly is ready for a little fun, only to get stuck with an anger management group that turns dangerous when a gun-toting granny loses her temper. Kate’s hopes for some frisky business are further put on hold when a monster forest fire erupts several hours south of Atlanta, drawing firefighters by the droves, including Jay. Kate’s professional life isn’t faring any better. Her patients seem to be getting kookier, her junk-dealing mother and aunt more outrageous, and her secretary is convinced her peculiar rash is something akin to leprosy! Kate is forced to hire oddball temp employee Abigail Davis who becomes fixated with her. If Kate thinks it strange when Abigail’s “makeover” leaves them looking frighteningly identical, she soon has to wonder just how far the troubled young woman will go to in order to win Kate’s affection. 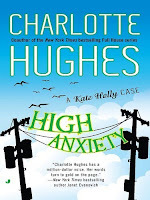 Charlotte Hughes’ unique humor, fast-paced action and dialogue combined with thought-provoking happenings and emotional quagmires make HIGH ANXIETY a roller coaster ride for the reader. From breathtaking laughter to heart-pounding fear, HIGH ANXIETY pulsates with life. Kate Holly, a compassionate psychologist, strives to guide her patients to a safe haven, away from the emotional and psychological problems that impede their ability to function in the world they live in. Helping them to reach some kind of “normalcy” in their lives is difficult while her own life careens out of control. As she deals with fear for her ex-but-still-loved husband’s safety, with the guilt that her mother continually dumps on her, with a really spooky stalker, with a rumor she is a atheist, and a myriad of other issues, Kate flounders but proves to be not only a survivor but a winner. All the characters make the story bubble with life. 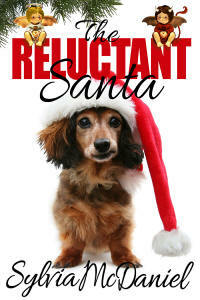 Their eccentricities, irreverence, charm passions, phobias, and dramatic antics keep the reader captivated. The depth of friendships and loyalties some of the characters have create special scenes in this story even though it is full of zany actions. Many human foibles are evident in the characters. Even though prejudice rears its ugly head at times, acceptance of people regardless of their flaws is an element that adds depth to the story, yet it is slipped in with the humor so subtly the pace of the story never flags. If you read WHAT LOOKS LIKE CRAZY, you feel as if you are reconnecting with old acquaintances in HIGH ANXIETY. If you haven’t read it, you have a special treat in store because these delightful characters tickle your funny bone, touch your heart, and take you to a world apart from the mundane. Incredible writing and superb reading!